Straddling its huge rock, towering over Tibet's capital, Lhasa, the Potala Palace is one of the most iconic buildings all over the world and is the symbol of Tibet itself. Standing at an altitude of 3,700 meters above the sea level and with over one thousand rooms on thirteen floors; with its 119 meters height, it is the highest palace in the world. Besides, it’s the world’s largest and the most intact ancient castle-style palace. With its base on the southern slope of the Red Hill, the Potala Palace was built along the hill and is about 360,000 square meters. 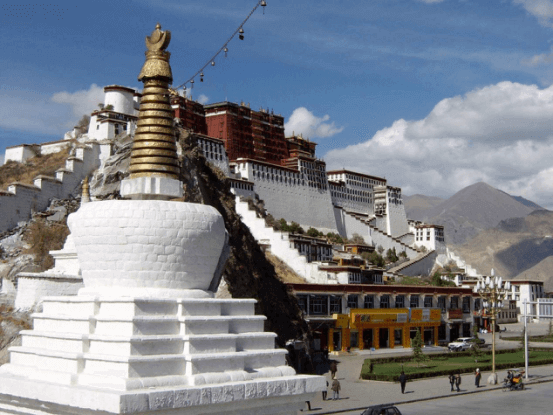 Its crimson and white wall and its goldenroof shine in glory in Lhasa, the “city of sunlight”. Actually, the palace combined with The White Palace and Potrang Karpo, which was the living quarters of the Dalai Lamas and his reunine. It was the secular center for the Tibetan government too, and contains office and printing rooms. The central part of the palace is the Red Palace or Potrang Marpo. This was devoted to the study and practice of Tibetan Buddhism and contains many halls, chapels and libraries, all linked by a maze of winding dark passageways. It is also the final resting place of the eight Dalai Lamas, including the Fifth, who built the palace. Here you can see the Saint's Chapel, the holiest chapel of Potala . As for its construction, it could date back to the seventh century and it is the oldest part of the palace. Beneath the chapel is the Dharma Cave, which is believed to be the study retreat of King Songtsen Gampo and he studied Buddhism there. The North, South, East and West Chapels contain a great deal priceless statues, religious artefacts and precious scriptures. The West Chapel is the rest place of the Fifth Dalai Lama, whose mummified body is in a 14.85 meters high, sandalwood stupa, covered with 3,727 kg of solid gold and studded by over 18,000 pearls and other precious stones. The Great West Hall is the centrepiece of the Red Palace and bears a number of murals depicting scenes from the life of the Fifth Dalai Lama. The most famous one depicts his visit to Emperor Shun Zhi in Beijing. Besides the two palaces, there is a large square known as Deyanshan, or "Eastern Celebration Square". This yellow painted square was used for religious ceremonies and gatherings. From here you will find three entrances to the White Palace. The central door was for the exclusive use of the Dalai Lama. Other buildings in the palace including the Buddhist College or Zhacang, Buddhist schools and lodging houses, etc. 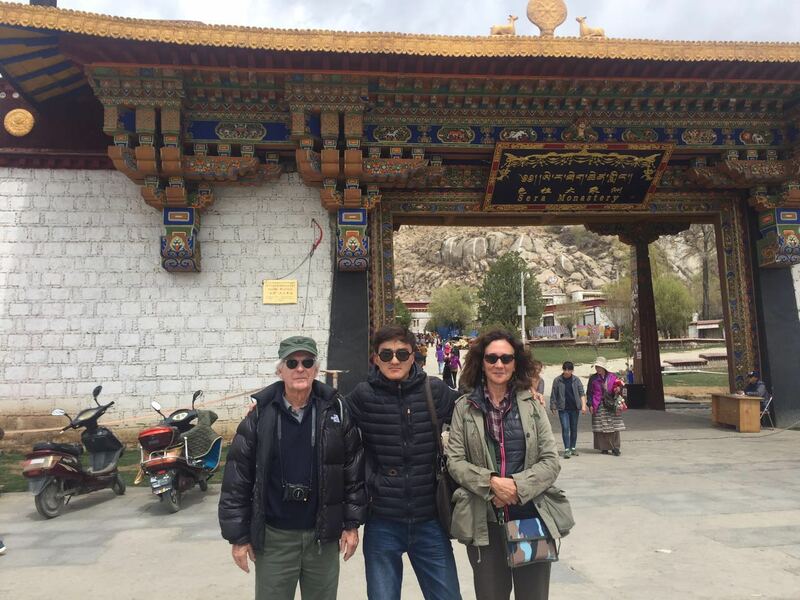 In order to help protect the Potala and its treasures, and to make tourists visit more here much more delighted, the tickets are limited to 2,300 every day. 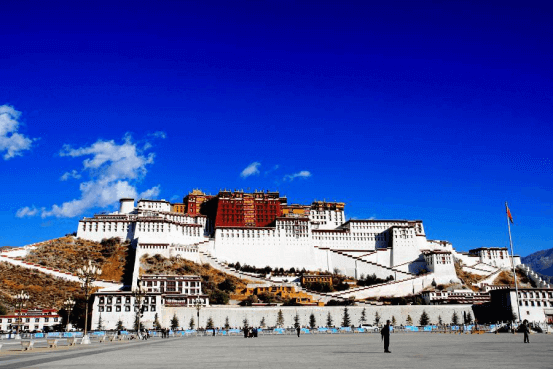 It is no doubt that travel in Tibet without visit Potala Palace--one of the world’s most famous and crucial buildings will be a big regret, and the tour cannot be complete. Today, the palace is a museum and being protected, it was in the UNESCO world heritage list since December, 1994. 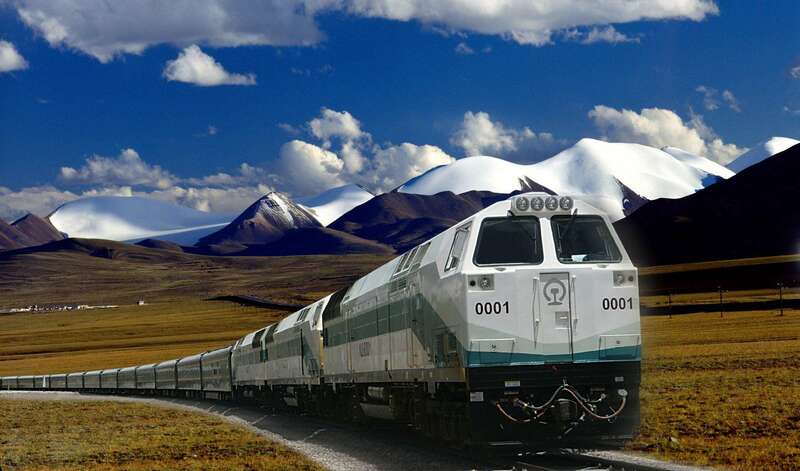 Besides, the State Tourism Administration rated it as the 4A tourism spot of the national level in 2001. With a grand stele celebrating the architectural achievements of Tibet, it is really a cultural treasure of the Chinese nation. Actually, the Patala palace started to be constructed by the Fifth Dalai Lama Lozang Gyatso in 1645 and it is the unique building of Tibet that integrates the continuous efforts of generations of Tibetans. It has been used as a palace since the year of 637, when King Songtsen Gampo built a palace to celebrate his marriage to China's Tang Dynasty Princess Wen Cheng. In the early 1940s, the head of the Hoshod Mongols in Xinjiang and Qinghai invaded Tibet and toppled the Tsangpa Desi’s regime in Shigatse. Fortunately, with the support of Gushi Khan, the Fifth Dalai Lama established the Grandain Phodrang regime in Lhasa. Therefore, Lhasa became the center of politics, culture and religion in Tibet again. While the current palace was mainly built on the base of the ancient palace ruins since the seventh century. After the establishment of the Ganden Phodrang Regime of the Fifth Dalai Lama Lobang Gyaico, the Potala Palace was reconstructed in the spring of 1645, and the current palace was mainly constructed between 1645 and 1694 by the Fifth Dalai Lama as his winter palace and the center of Tibet's government. 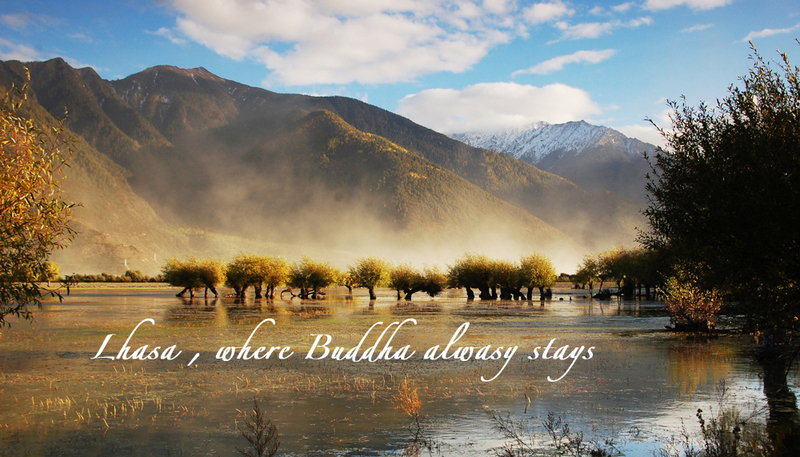 It was for many years thereafter the home to successive Dalai Lamas and has been enlarged and renovated many times. In 1653, he went to the capital of China and met the Emperor Shunzhi of Qing Dynasty. In the following year, the Emperor Shunzhi granted the fifth Dalai Lama official supremacy in both administration and religion in Tibet. After the Fifth Dalai Lama’s returning to Lhasa, he moved his residence from Ganden Phodrang of Drepung Monastry to the White Palace. In 1690, eight years later, the fifth Dalai Lama started to tear down some of the old buildings in order to give way to the Red Palace and the holy stupa. Furthermore, this project involved 7,000 craftsmen, including 114 skilled craftsman of Han and Manchu nationalities that were dispatched by Emperor Kangxi. Besides, this project costed 66,154 kilos of gold. And Nepali government also gave a hand of this project. 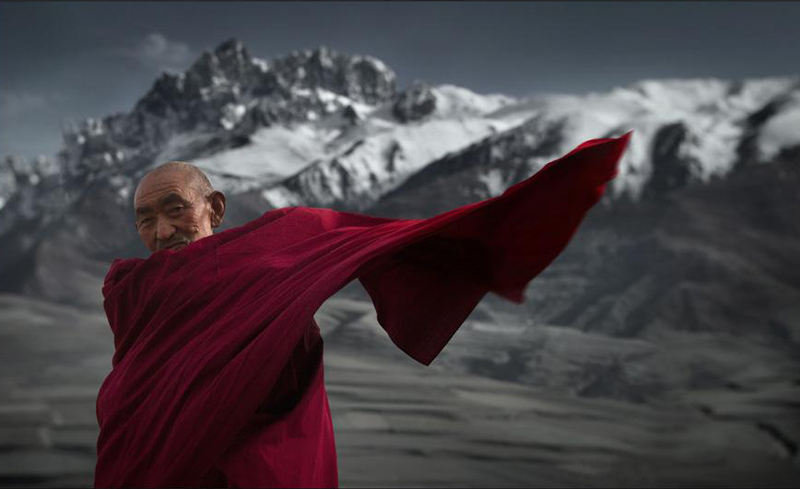 1.You should better take a coat with you because it is cold in the Potala Palace, even in summer. 2. You get an hour at most to visit the palace. 3. Liquid of all kinds is banned inside the palace. 4. There is only one toilet room in the palace, you’d better answer the call of nature before your visit. As for the Toilet room, it is at the right side of the White Palace Square and it is the most beautiful one in the world. 5. Chakpori Hill is the ideal place to shoot the Potala Palace.